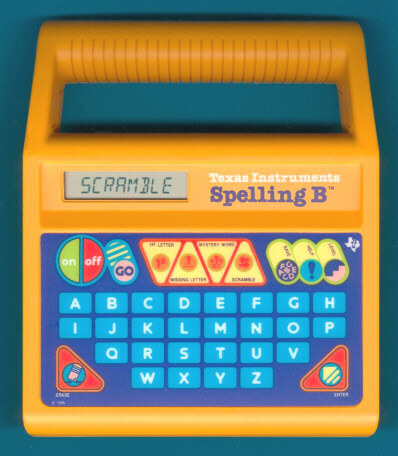 This educational toy for childs teached the spelling of simple words. The same idea was sold 8 years before with the first version of the Spelling B. Five entertaining games provide challenging practice and recognition activities for over 250 words. Two of the games are based on the concept of word-picture association. Other activities encourage logical and strategic thinhing. This educational toy was rated by Texas Instruments for childrens aged between 5 and 12 years. The Spelling B shared the housing with the Math Star teaching math games.